Heat oven to 350°F. Place pie crust in 9-inch glass pie plate or quiche pan as directed on box for One-Crust Filled Pie. Cover bottom of pie crust with crushed croutons; sprinkle with Cheddar cheese. 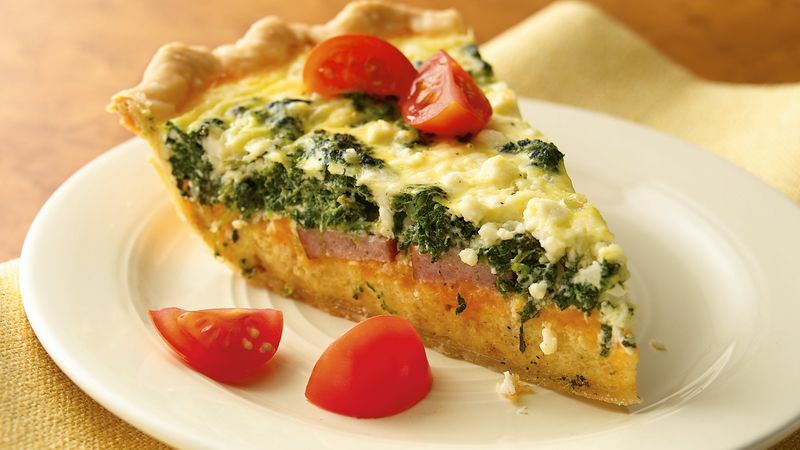 Layer sausage slices on cheese; top with spinach, onion and feta cheese. In large bowl, beat eggs, half-and-half, salt and pepper with wire whisk until well blended; slowly pour into pie crust. Bake 45 minutes. Cover crust edge with strips of foil. Bake 5 to 15 minutes longer or until knife inserted in center comes out clean. Let stand 15 minutes before serving. Garnish with tomatoes.